We all go through food phases. The kind where our senses, stomach, and mind come together and fall head over heels in love with a dish, cuisine, or flavor. For a while, that love is insatiable. You’re thinking about it all the time, changing meal plans and life plans to get that fix. That delicious fix that just makes every part of your body sing. The high lasts for a few weeks or months, and then the fire for it settles down until a new food or flavor stokes it. Not long after I had moved out to Los Angeles, I fell into a Thai food phase. Los Angeles has an impressive Thai food presence all over the city, unlike where I had grown up. Through friends at school, N and I discovered our favorite neighborhood Thai place. I loved the heat and creaminess of curries, the newness of jasmine rice, and the comfort of a family style meal. The fire of this food phase quieted for one reason or another, and things kept going. As things for busier and purse strings tightened, our neighborhood Thai place got visited less and less frequently. The heat and creaminess became another lovely memory. 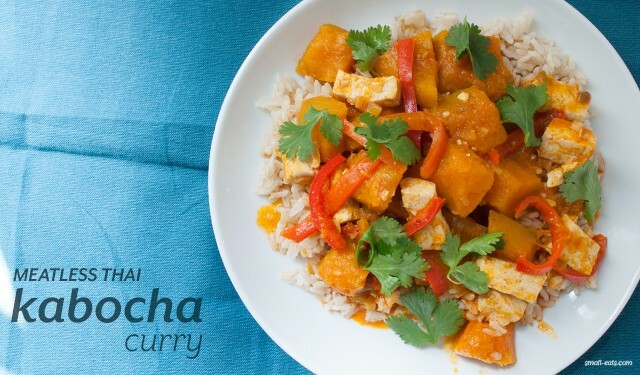 When I was researching kabocha, curries kept appearing on my screen. With each curry, the lovely memories bubbled in my mind. Maybe it was time to dip a toe back into my Thai food phase. I used the other half of my kabocha squash from last week’s recipe and added in some of my Thai curry favorites. Although you’ll notice the recipe calls for a few Thai chilies, the sweetness of kabocha and coconut milk mellows it out. I used extra firm tofu as my protein, but feel free to swap it out for another protein, meat or meatless. Later in the day, after I had made this recipe and left to do some errands, I stepped back into my place and was wrapped in the wonderful smells and memories of Thai food. Maybe I’ll dip more than a toe back into this phase. Next week a NEW Nutrition DL begins, highlighting another seasonal ingredient’s nutrition and four ways you can bring it to your table. If you have a seasonal ingredient or pantry staple you’d like to see featured, email me at hello (at) small-eats.com or let me know on Twitter. Bring a pan to medium heat on a stove. Add a tablespoon or less of olive oil. Once hot, sauté ginger, onion and garlic until translucent. Pour curry paste and coconut milk into the pan and stir until curry paste is completely dissolved. Add squash, bell peppers, soy sauce, tofu and chilies into pan. Stir carefully to combine. Bring to boil and simmer for 10-15 minutes, until squash is fork tender. Salt to taste. If you want a thicker curry, cook uncovered for 5 minutes more. Serve over brown jasmine rice and garnish with cilantro. Aimee, so funny… I just ate a delectable kabocha curry bowl yesterday for lunch and it was so so good. I thought to myself… why don’t I make something like this at home? And here you are with a great recipe for me. The universe has a wonderful way of working!